In late August, I finally made it to the Pure Markt Amsterdam in Park Fraenkendaal and had a great time. Tomorrow, there will be a special Pure Markt that brings many of the great food stalls of Pure Markt to Oosterpark for the opening of the Dutch Week of Taste. That’s a great opportunity to try and buy the home-made sausages, Delft grapes or chocolate coated cranberries that I loved at the last Pure Markt! Where was I?! Why was I not here?! Oh yes, now I remember, was in Morocco… gutted to miss it though. Was it any good? I missed it, too. Bummer! Was eating my way through Montreal at the time, which has an amazing number of quality restaurants. How did you like the food in Morocco? Luckily we do get a chance to make up for it. 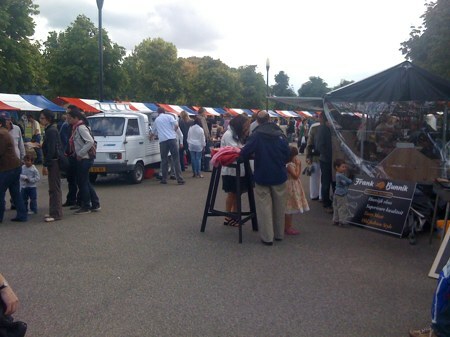 This coming Sunday is the last edition of 2009 of the “Pure Markt” in Park Frankendael.